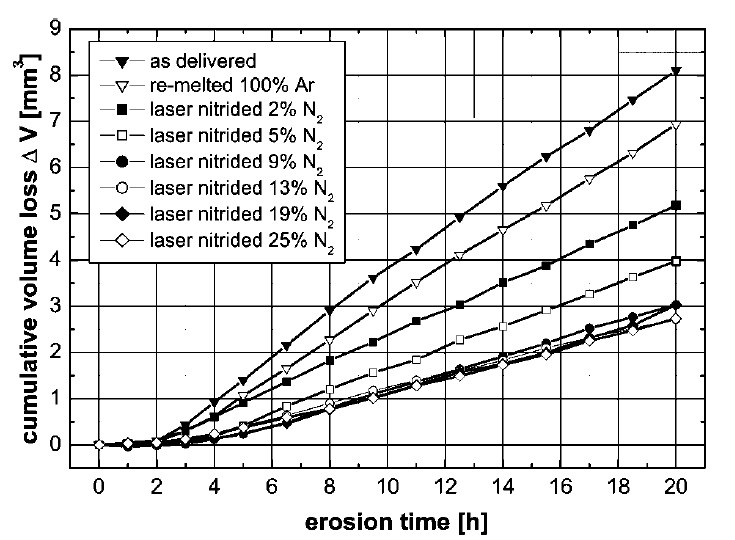 The figure below shows the typical progression of cavitation erosion (from Young, p. 15; 25 kHz, 44.5 microns, 24 °C water). In ultrasonics the cavitation is often deliberately produced by an ultrasonic horn in order to see the effect on a process (e.g., ultrasonic homogenization). However, this cavitation gradually removes material from the face of the horn. This causes several problems. As the tip shortens the frequency of the system increases until the power supply can no longer start the horn. As the horn face becomes pitted by erosion, it produces less cavitation which thereby impacts the process. The eroded material may contaminate the process. Use a horn material that has higher cavitation erosion resistance. Use a coating that has higher cavitation erosion resistance. Improve the horn's surface finish. Use a horn with a replaceable tip. The test method for ultrasonic cavitation erosion is specified by ASTM cavitation erosion specification G32-10. Appendix A gives a brief overview. A solid horn would be expensive to replace after cavitation erosion. Instead, expendable tips can be used with horns whose face diameter is less than about Ø25 mm (see figures 4). See tips. Various coatings have been used to improve cavitation erosion (compared to titanium as a reference). These coatings can be applied to tips but can also be used where the base horn material must be preserved (e.g., titanium), where the horn's face area is too small or too large to accept a replaceable tip, or where the face is irregular. Coatings can be classified according to their thicknesses: thin or thick. They can also be classified according to whether they are ductile or brittle. Coatings can be considered thin if the inertial forces due to the ultrasonic vibration are relatively low. Then the adhesion force does not have to be high. These coatings include chrome and titanium nitride. 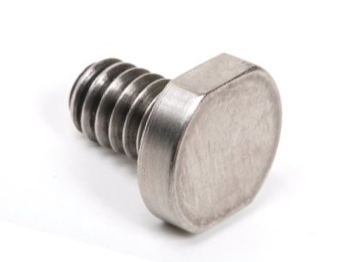 Because of its hardness and good adhesion, titanium nitride has long been used to reduce cavitation erosion. However, the process can't be applied arbitrarily. Kaspar investigated laser deposited titanium nitride on Ti-6Al-4V for various percentages of nitrogen in a nitrogen-argon atmosphere. 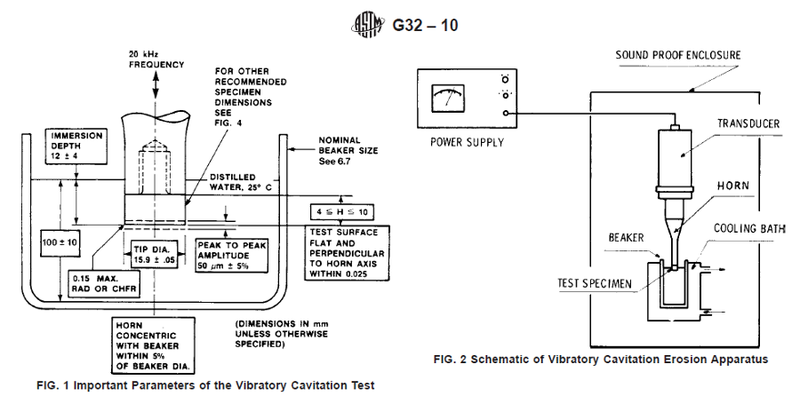 The cavitation tests were conducted according to ASTM G32-92 in deionized water at 25°C. Cavitation was induced by 20 kHz longitudinal oscillation at 40 microns peak-to-peak with a standoff distance of 0.50 mm between vibrating tip and the stationary sample. Figures 5 and 6 show the results. Note that increasing the nitrogen atmosphere up to about 13% (micro-hardness ~550) steadily reduces the cavitation erosion. At that level the erosion rate is about 3x lower than the as-delivered titanium. However, further increases in nitrogen and hardness don't further reduce the cavitation erosion. Matsumura has found that even when the titanium nitride has been removed, the base material still has improved erosion resistance due to the remaining residual stress. Due to their mass, thick coatings must resist substantial inertial forces. Then inadequate adhesion between the coating and the base material can be a problem. If such coatings are also brittle then they cannot be applied over a large area (e.g., cleaning tanks) because the ultrasonic flexure will cause them to crack. Sapphire is extremely hard — 9.0 on the Mohs scale where diamond is 10. However, sapphire is also very brittle. The results of using sapphire against cavitation erosion seem to be mixed. Misonix (under its predecessor Heat Systems) developed a process for bonding a sapphire wafer to a solid horn. (p. 8‑6) Their literature claims that the sapphire wafer should last 10 times longer than a titanium tip in cavitation applications. The sapphire is boule-grown synthetic. The wafer is bonded with an extremely high shear epoxy. However, this epoxy is subject to cavitation erosion and leaching under strong chemical attack. Because sapphire is brittle, any visible loss of epoxy will cause the sapphire to fail. Damaged or eroded disks can be replaced at the factory. The sapphire was a single crystal. The process was initially successful and gave high erosion resistance. However, at some point the formulation of the adhesive apparently changed which caused unspecified problems. Sapphire could not be used with a replaceable tip because distortion (bending) of the tip during tightening caused the sapphire to fracture. Also, Sonics & Materials reports, "Results with affixation of sapphire and ceramic tips have also been poor. They are expensive and shatter or separate within minutes." Qsonica has inherited Misonix' process. Gunnerman's patent 6,652,992 B1  claims that silver (preferably 99% pure) can significantly reduce the ultrasonic cavitation erosion of a titanium horn (preferably 99% pure but at least 85% by weight), particularly in aqueous media. 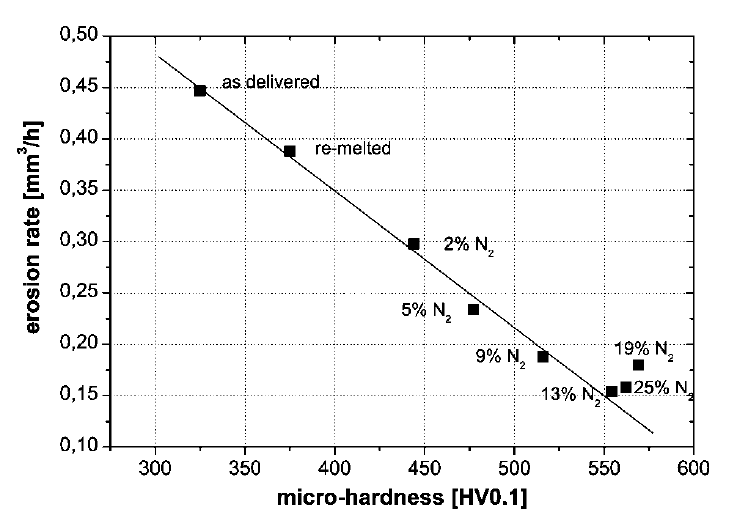 Table 1 compares the Vickers hardness HV of silver to different titaniums. 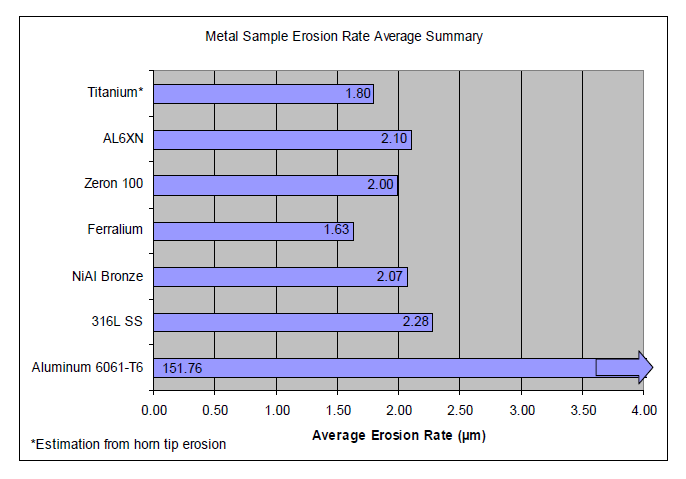 Since cavitation erosion resistance is typically related to hardness and since Gunnerman presents no supporting data, his erosion claims seem rather dubious. 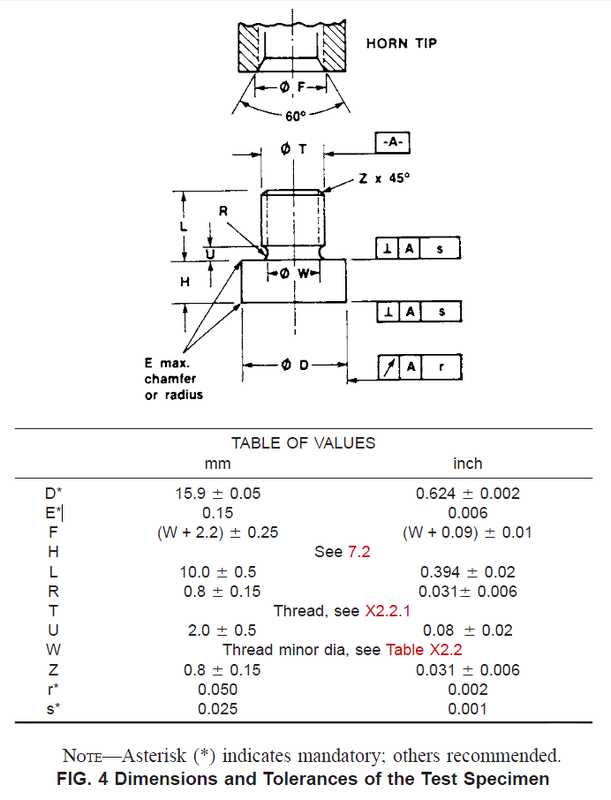 Hardness values are from matweb.com. Although Gunnerman specifies 99% pure titanium as the preferred resonator material, this material is unlikely in practice. Instead, Ti-6Al-4V (annealed) is most widely used. The test method for ultrasonic cavitation erosion is specified by ASTM cavitation erosion specification G32-10. Note: the number after the dash ("10" in this case) refers to the year of the last revision. However, previous versions are likely to be substantially similar. In the standard method, a test specimen of the desired material is machined as a tip and screwed to an ultrasonic horn. If a coating is being evaluated then the coating is applied to the tip. 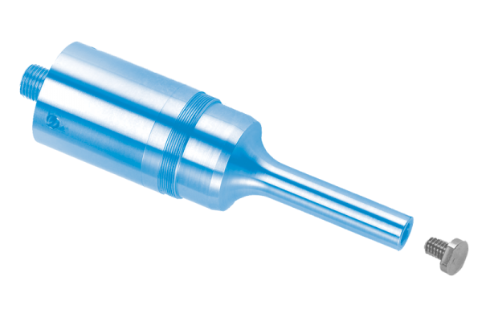 The tip is activated in a liquid (typically water) and the rate of cavitation is determined. An alternate (unofficial) method is often used. In this "stationary specimen method" the test specimen is attached to a stationary platform and the vibrating horn tip is placed in front of it. The cavitation from the horn then acts to erode the stationary specimen. Unfortunately, various findings show inconsistent results because the horn-specimen gap has not been standardized (ASTM G32-10, p. 17). 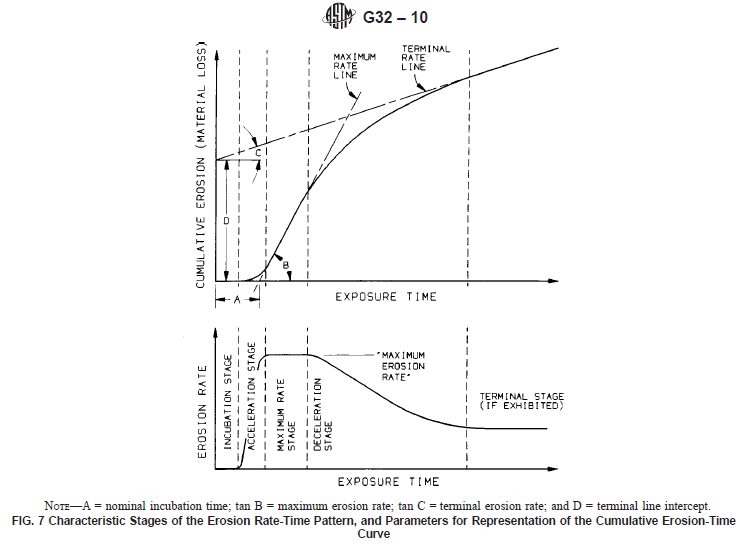 The following is a brief overview of ASTM cavitation erosion specification G32-10. See that source for complete information. Set up the test equipment as shown in figures A2. Note that the amplitude is specified as peak-to-peak. Machine the tips as shown in figure A3. Immerse the tip in the test liquid (often water, distilled or deionized) and run for a specified time. Remove the tip, dry the tip, and carefully weigh it. Repeat steps 4 and 5 until a termination criterion has been reached. For example, the test may be terminated when the average rate of erosion has reached a maximum and begins to diminish. Figure A3 shows typical erosion stages in a cavitation test. As figure A3 shows, cavitation rate of erosion is not constant with time so it cannot be fully characterized by a single number, nor can long-term behavior be predicted from a short-term test. ASTM G32-10 (p. 10) specifies that certain values must be reported. Maximum stable rate of erosion. This is the maximum linear (or near linear) erosion rate after the initial incubation period. This is the slope "B" of the "maximum rate line" of figure A4, typically expressed in μm/hour. Nominal incubation time. This is intercept of the maximum erosion rate line on the time axis (the value "A" of figure A4). Time to achieve a chosen mean depth of erosion (MDE). Mean depth of erosion (MDE) after a chosen exposure time. However, as ASTM G32-10 notes, "Because of the shape of the cumulative erosion-time curve, it is not meaningful to compare the mass loss or MDE for different materials after the same cumulative exposure time. (The reason is that a selected time may still be within the incubation or acceleration stage for a very resistant material, whereas for a weak material the same time may be within the maximum rate or deceleration stage.)" Terminal erosion rate. This is the slope "C" in figure A4 if the test has continued for a sufficiently long time. When tests are performed according to ASTM G32-10 the results are reasonably repeatable for identical materials. However, materials that are nominally identical (in a macro sense) may actually may perform very differently when exposed to cavitation erosion. This may be due to processing differences, differing grain sizes, etc. Garcia (p. 216) notes, "It is the experience of this laboratory that supposedly identical materials taken from different heats may have variations in applicable mechanical properties as great as 50%." 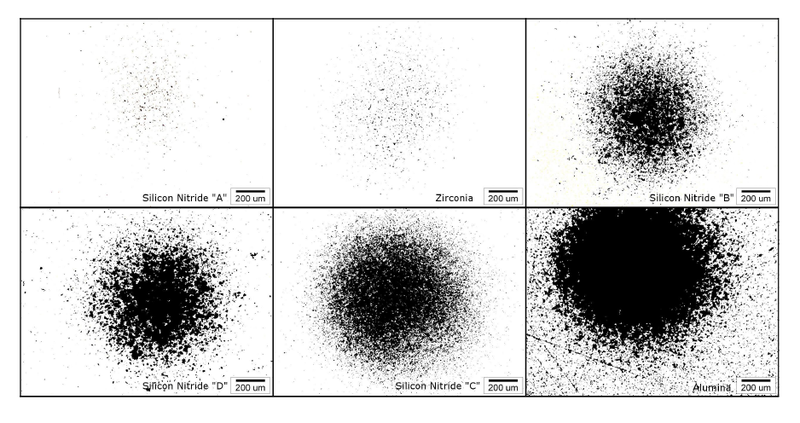 For example, figure A1 shows cavitation erosion of silicon nitride ("A", "B", "C" and "D") from different manufacturers after 120 hours, all tested under the same conditions (Fatjo, p. 12). For this test the material loss from silicon nitride "C" was 90 times greater than for silicon nitride "A". In other investigations certain specifications of ASTM G32-10 may have been violated (e.g., using a different tip size, amplitude, frequency, etc.) or differing test termination criteria may have been used. Also, different cavitation liquids may be chosen where, for instance, the corrosive effects of sea water may accelerate the cavitation erosion. These problems mean that comparison of results among various investigators may be difficult. Hardness is the primary material property that correlates with cavitation erosion resistance. Hardness in the base material can be produced globally (e.g., by through hardening) or locally (e.g., by surface hardening or shot peening). 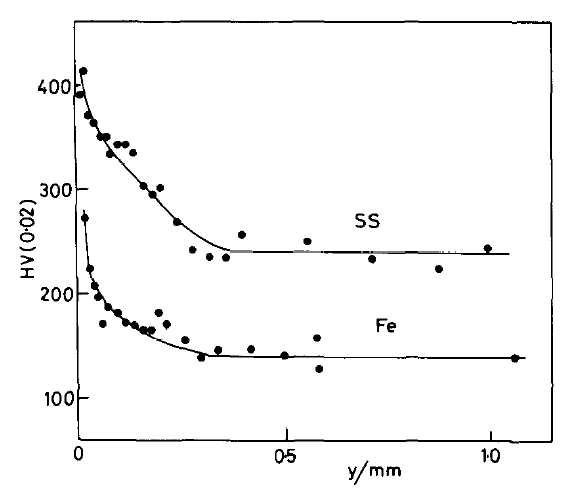 Shot peening reduced the stabilized erosion rate by a factor of 5 in the distilled water and a factor of 13 in the salt water (Tomlinson's table 1, p. 238). When a material is initially exposed to cavitation, there may be an initial stage during which the erosion rate is negligible compared to later stages. This incubation period can be extended if the surface is highly polished. The following information is provided for reference. Many of the listed materials may not be suitable as ultrasonic horns because of loss, fatigue, cost, and/or material availability. For example, although many steels have lower erosion rates than titanium, their output amplitudes are limited by internal losses (heating). However, this heating problem can be improved with an optimized profile that reduces the local ultrasonic stress. In any case, some of the materials might still be suitable as replaceable tips or coatings. The cavitating fluid is room-temperature water. The amplitude is 50 microns peak-to-peak. The following table is from Knapp (p. 425) who adapted it from Garcia (table 13, p. 130; table 14, p. 140). The data were obtained in accordance with ASTM G32-10 (see Appendix A). However, the tip diameter was 13.9 mm (p. 33) rather than the standard 15.9 mm. The MDP for single crystal tungsten was 0.025 mils/hour (table 29, p. 201). In addition to water tests, cavitation tests were also conducted in high temperature lead-bismuth, mercury, and lithium. Other materials were also tested. The following chart is from Light (p. 40). The data were obtained in accordance with ASTM G32-10 (see Appendix A). However, the tip diameter was 10.5 mm (p. 65) rather than the standard 15.9 mm. The "erosion rate" is the maximum rate of erosion which is defined as the slope of the straight line that best approximates the linear (or nearly linear) steepest portion of the MDE (mean depth of erosion) curve (occurring after the incubation period) and is expressed in micrometers per hour. This is the slope of the "maximum rate line" of figure A4. 316L stainless steel was used as a reference material since it is often used in cavitating environments including turbine blades, valve and piping components. AL-6XN (UNS N08367) is an austenitic stainless steel that has high resistance to chloride pitting (e.g., sea water) and other very corrosive environments. Knapp (p. 351) notes, "It is logical that cavitation and corrosion should be mutually reinforcing so that the resulting damage is often much greater than the sum of the two, if each acted alone." Thus, compared to other materials this material (or similar) might exhibit relatively better cavitation performance if tested in a corrosive environment. Ferralium is a high strength, corrosion resistant stainless steel produced by Langley Alloys of Staffordshire England. Zeron 100 is a similar grade of material produced by Weir Materials and Foundries in Manchester England. NiAl bronze is specifically used for propellers (liquid applications) because of its resistance to cavitation erosion. If the specific grade of titanium is not specified below then it is presumed to be Ti-6Al-4V (most commonly used in ultrasonic applications). Elbert's patent states that, "heat treated titanium was found to perform much better than regular annealed titanium." (p. 3, line 17) (Elbert doesn't specify the meaning of "heat treated titanium" but this is likely the STA (solution treated and aged) condition.) In fact, Elbert speculates that horns made of the heat treated titanium would provide two to three times more life than those made of annealed titanium. (p. 3, line 24) However, given that Elbert doesn't provide any comparative data and that STA titanium is only 13% harder than annealed titanium (table 1), Elbert's speculative improvements seem unlikely. In cavitation tests on twelve stainless steels in water, Bordeasu (p. 5) found that optimum resistance to cavitation erosion occurs when the ratio of chrome to nickel content is approximately 1.8:1. This was true regardless of the actual chrome or nickel content.